The opponents for the following year are set in place at the end of each season. The NFL has a well thought out system that works for everyone. Each team, of course, plays their division rivals twice. There is then a rotating system to make sure that every team will play each other throughout the years. This year, the Vikings will face the NFC West and the AFC East. The final two games are determined by how the team finished in the division. 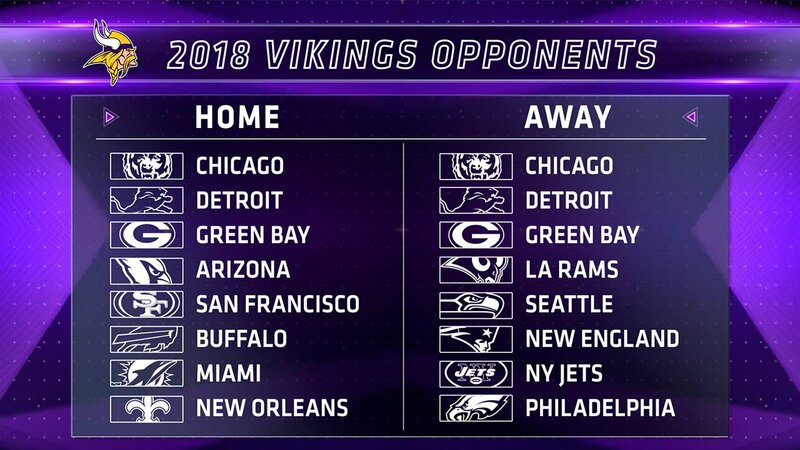 The Vikings finished first so they will play the other first-place finishers, New Orleans and Philadelphia. Here is an extremely early look, in a Viking fans perspective, of the 2018 opponents. Chicago The Bears, before Zimmer arrived, was an extremely tough victory, especially in Chicago. The Vikings have turned that around in recent years even though it has been some ugly games to watch. Remember one-legged Bradford leading a 3-0 game heading into the half? (Thanks for saving the day, Keenum) The Bears have not been good as of late. They have been battling injuries and putting their cards on a young quarterback. I like where Trubisky is heading, and their defense showed signs of decency last season after finding some young talent. Also, they said goodbye to John Fox. (Damn, I had hoped he would stay put) And were quick to hire Matt Nagy, former offensive coordinator for Kansas City, which will give this team a new look and can go nowhere but up. They will need Kevin White and Cameron Meredith to return to good health and put more talent around their young quarterback. Look, this team is still a few years away. Green Bay Aaron Rodgers is back. This will be one of the biggest storylines of the season and Vikings fans everywhere will eventually get tired of hearing about it. Frankly, I am already tired of it, and it has not even started. I anticipate things will be different after Ted Thompson transitioned from General Manager to Senior Advisor. Not sure what in the world that means but I would expect a more aggressive approach to get talent around Rodgers this offseason, which will not take too much aggressiveness to beat..... Joe Philbin is the new offensive coordinator (McCarthy will still call plays), and Mike Pettine is the new defensive coordinator. These are both excellent hires, and needed to happen otherwise Packers fans might have gone crazy after a 7-9 season with Rodgers getting hurt exposing multiple holes in their roster. I just hope the Packers continue to fail to put enough talent around their star quarterback. Either way, Rodgers is good and he makes everyone around him better. I anticipate one of these games will be on primetime. I can already see the commercial the week before, "Rodgers Revenge Game." Blah. Detroit The Lions have been so close yet so far to becoming a playoff team. Last season, Mathew Stafford led comeback after comeback. Their slow starts on Sundays eventually caught up with them, and they once again devastated their fans. Hey, I know the feeling too, Detroit, and yes I am still bitter about the NFCCG. This Lions team is so up and down, and what makes this team scary to play each week is not knowing which team you will get. Maybe the new head coach, Matt Patricia, one of my favorite new hires in the league, will bring stability to this team. Mathew Stafford is begging you guys. He is one tough dude, by the way. San Francisco Jimmy G got paid. How will he look next season? It sure seems optimistic, and part of me is slightly jealous of the 49ers trade that shocked the world with the Patriots last season. I anticipate it will take a few years to build that defense back up to par. New Orleans A rematch of the game that shocked my soul last season. I still remember jumping up and down, yelling, "THEY DID IT!" Leading me to buy a Stefon Diggs signed, rather large picture of him running into the end zone. Ahh, memories. It could potentially be another primetime candidate. I cannot wait to reminisce, watching the highlight, over and over, before this game. (Sorry Saints fans) This will be a fun one. Next will be what I anticipate the afternoon games that nobody besides each teams fan base will watch. Buffalo The Bills broke the longest streak in the NFL of missing the playoffs last season by clinching a playoff birth. Seems about right to start another streak eh? Tyrod Taylor is the most exciting storyline heading into next season.... Yeah. Next. Miami Ryan Tannehill is set to return from an ACL injury, and Jay Cutler does not know what the heck he is doing. Hopefully moving out of the Hotel in Miami should be his first step. Jarvis Landry was the first player in the league set to a franchise tag, and I do not even want to ask why. Philadelphia The defending Super Bowl Champions. I still cannot believe it. Way to go, Nick Foles. This team is not done, and if I were you, I would look for them to be around the top end of the scale in the league for quite some time. I would not be surprised if this is the game chosen to open up the 2018 season on Thursday Night Football, and it may potentially be against Foles if Carson Wentz is not ready. The Vikings players should want this rematch. There is a revenge story for Vikings fans that has nothing to do with Rodgers, thank goodness, and I hope it goes in Minnesota’s favor. I can guarantee I will not be going to Philly to watch this game. Kudos to you if you are dedicated enough to go. No thanks. LA Rams A rematch of one of the most exciting games last season. The Rams are another team that may be tough to beat for quite some time. Seattle I still believe Russell Wilson should have won the MVP. He was unbelievable around some pretty crappy talent. The Seahawks may be on the downfall but going into one of the loudest stadiums in the world will always be tough. NY Jets No easy victory is ever found on the road, but this may be the easiest of away opponents. Maybe Teddy will lead a walk-off winner like the last time against the Jets? New England Why not play both teams to make the Super Bowl on the road next season? That sounds awesome, right? Not really, but this may be one of the last times the Vikings will face Tom Brady unless they play each other in the Super Bowl, or Tom Brady plays until he is 45, so it may as well be a memorable one in Foxboro. The 2018 schedule is jam-packed with action and storylines. Look for the Vikings to play multiple games on primetime. The home opponents seem doable, but the road opponents looks scary this early in the offseason. It is essentially a guessing game trying to predict how difficult the schedule will ultimately be. I love the direction that this Vikings franchise is heading, and with the leagues third-youngest roster last season, my optimism is high. Last season, I remember looking at the schedule and thinking the same thing as this year, "That looks difficult." It always does, and the league is too unpredictable to know for sure. I mean look at who won the Super Bowl last season. I still get mad every time I wake up this last month from that awesome dream of the Vikings being the next Super Bowl-less team to win it all. "It is just a dream, Chris, it is just a dream," and in the back of my head, I say with a little bit of hope, "For now."